The ways of marketing have changed drastically over the last 50 years. Brands are now more easily accessible to consumers through social media, they have created interactive campaigns, and more brands seem to be indulging in TV commercials that grab attention. But one thing has remained: nothing says advertising like handing out free things with your logo on it. Spring break is not an exception to this rule. It has become a hub for expensive and outrageous advertising campaigns. 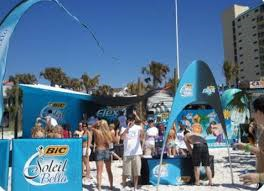 All through March, companies like Unilever and Gillette are infiltrating Daytona Beach and Panama City Beach in Florida with sponsored events, beachfront oxygen bars and ads on everything from the simplest of koozies to even pillow cases and shower curtains. Booths and buses line the street to attract consumers to a free gift bag that undoubtedly exposes them to their logo and their brand thousands of times that week. With all of this constant exposure to sunlight and advertising, one would wonder if it makes a difference in the sales of the products that are featured. The demographic of 18-24 year olds are fascinated with getting free things, and getting them immediately. We are not the group you choose to sit down and take a survey and receive something in the mail two weeks later. One company that has made it its mission to attract spring breakers is Axe, the brand that makes body sprays and shower gels, but is more famous for its provocative commercials and advertising techniques. They have been attending spring break since ’06, in which they first created the “Axe Boot Camp: Spring Break Readiness” campaign to attract young men to buy their products. That year, Axe also was featured in hotels with room keys stamped with Axe logos and posters in lobbies and elevators. The ads they featured before the week of spring break could’ve made mothers cringe at the thought, but young adult men fantasize about their spring break adventures. 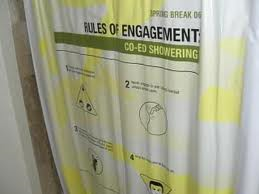 One ad offered “rules of engagement” on co-ed showering. Another gave tips on how to successfully proposition a woman in an elevator. Hotel guests were even given customized do-not-disturb signs that read “Mission in Progress.” One thing is for sure, Axe did not leave anything to the imagination for its consumers. As IMC students, we have a learned disposition to notice all and every advertisement and marketing technique we see, because we know that everything is advertising. The kids on spring break, however, see it as a free bottle of water in 80 degree weather. The companies behind these brands are obviously generating revenue or some sort of positive reinforcement from their time at spring break, but perhaps their real intention is to attract that demographic in hopes of sustaining a long term consumer to brand relationship. Nothing says vacation like a hot budding romance, and who says it can’t be with a brand?